Russian dancer and choreographer Leonid Massine (1896–1979) was a pioneer of modern ballet. His choreography, characterized by angular movement and rhythmically complex footwork, often caused controversy, as did his use of symphonic music. He was an early influence on Ninette de Valois and Frederick Ashton. Massine was born Leonid Miasin in Moscow. He trained at the Bolshoi Theatre School and in 1913 joined the Ballets Russes, where he studied with Enrico Cecchetti. 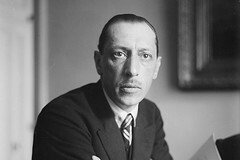 He made his choreographic debut in 1915 with Le Soleil de nuit; subsequent works included Les Femmes de bonne humeur, Parade (with Satie and Picasso), Le Tricorne (with De Falla and Picasso), La Boutique fantasque, Le Chant du Rossignol (with Stravinsky and Matisse), Pulcinella (with Stravinsky and Picasso), Le Pas d’Acier (with Prokofiev) and Ode. He left the Ballets Russes 1920–25, during which time he toured to South America and Scotland, established a dance school attended by Ashton and created works for Les Soirées de Paris. He joined Ballets Russes de Monte Carlo in 1932 and in 1933 created his first symphonic ballet, Les Présages to Tchaikovsky’s Fifth. This was followed by Choreartium (Brahms’s Fourth), Symphonie fantastique, Seventh Symphony (Beethoven), Rouge et noir (Shostakovich’s First) and Harold in Italy (Berlioz’s Second). In 1937 he became artistic director of the Ballet Russe de Monte Carlo, for which his works included Gaîté Parisienne (later filmed for Hollywood) and Saint Francis. Late work included the role of Shoemaker in the film The Red Shoes, for which he created his own choreography, and Laude Evangelii, Bouquet and Parisiana. Massine had an interest in the analysis of dance throughout his life, and promoted the teaching of choreography at The Royal Ballet Upper School. His books include Massine on Choreography (1976), in which he uses his own form of dance notation, and the autobiography My Life in Ballet (1968). How does The Royal Ballet School create such great choreographers? Several world-class choreographers began their training with The Royal Ballet School – how do they grow the dance-makers of the future? Follow in the footsteps of Diaghilev’s legendary dance company with a guided walk around Covent Garden.